Yesterday, Eminem finally delivered his Killshot to Machine Gun Kelly, with many believing the iconic rapper annihilated the up and comer. Others think MGK, with his Rap Devil beats, delivered the better diss track. 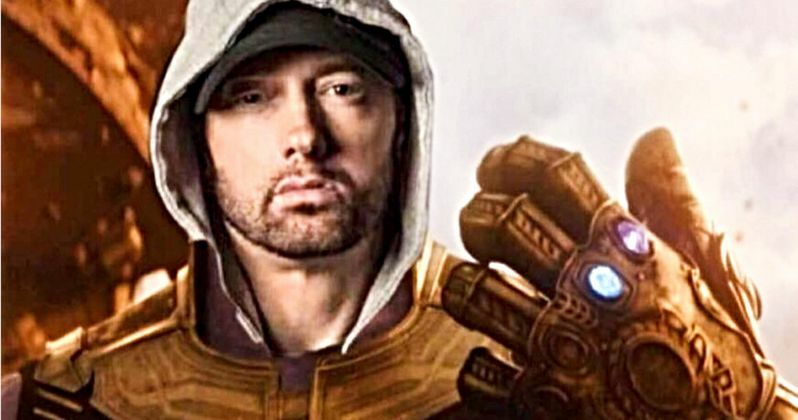 Now, the whole thing has been immortalized as a piece of fan art that depicts Eminem as Thanos, snapping his fingers and turning Kelly to dust. This is one great piece of Infinity War art. The whole beef started a few years ago, when Machine Gun Kelly tweeted out some words about Eminem's daughter Hallie, which the older rapper didn't like. MGK believed that Eminem, in retaliation, banned Kelly from Shade 45 and Interscope Records. In a recent interview with Sway, Eminem claims he did no such thing. But that didn't keep Kelly from bad mouthing Em in the press. Last week, Eminem released the surprise album Kamikaze, which fired a few warning shots in Kelly's direction. MGK retaliated with a full on diss track called Rap Devil, which propelled the young rapper to instant infamy. As Eminem explained to Sway, he didn't want to give Kelly any extra attention. But he knew he had to answer back. And he did so with Killshot. Killshot does what it's intended, even though younger fans are on Machine Gun Kelly's side. Em offers up some of his best and funniest rhymes in over a decade with Killshot, and it answers Kelly's callout that Em is old, rich and too out of touch with the current hip-hop fanbase. Which may or may not be true. Eminem even complimented Kelly on Sway saying that the kid got off a few funny lines himself. Here's an example of Marshal Mather's answer back. "'Slim you're old'. Ow, Kelly, ooh, but I'm 45 and I'm still outselling you. By 29 I had three albums that had blew...I'd rather be 80-year-old me than 20-year-old you." Slim Shady turns up the shade quite a bit, and goes back to one of the most notorious beefs in hip-hop history with this classic rhyme. "The day you put out a hit's the day Diddy admits that he put the hit out that got Pac killed." Kamikaze was Eminem's answer to all the negative press and criticism from fellow rappers following the release of last year's Revival. Kamikaze came on our radar because it also contains the theme song to this year's Marvel comic book adaptation Venom. Many believe Machine Gun Kelly's career is dead. But he's already starting to break out of hip-hop, going the Mark Wahlberg route with a number of acting roles in upcoming movies. He will make his feature film debut in the alien invasion thriller Captive State, which hits theaters this spring. The trailer arrived just this past week. He'll follow that with a role in the Sandra Bullock drama Bird Box. He is playing Tommy Lee in the Motley Crew biopic Dirt, which will drop on Netflix. And he's taking a lead role in Big Time Adolescence. So, even after Kelly got turned to dust by the real Slim Shady, it's possible he could thrive on the big screen, if he has the charisma to back up his acting skills. But we'll have to wait until Avengers 4 to see if MGK is resurrected along with the other half of the universe after the great finger snap of 2017. This awesome fan art comes from RyZe on Twitter.